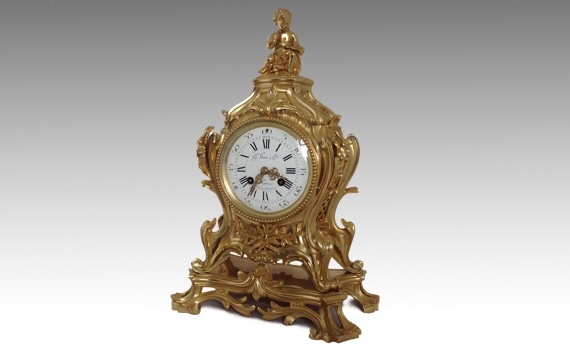 A late 19th century, French, Louis XV style gilt bronze mantel clock. The rococo case surmounted by a seated cherub with sundial in hand, above a large enamel dial painted with roman hours and arabic five minutes, standing on an acanthus droll platform base. The eight day Samuel Marti movement with Brocot escapement, striking the hour & half hour on a bell. Movement & Pendulum Numbered 46.